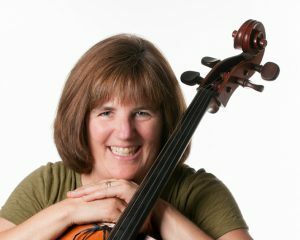 String Riffs spotlights the engaging music of composer Karen Koger, an experienced professional educator and performer. Koger’s background includes a bachelor’s degree in cello performance from The Ohio State University and a master’s degree in cello performance pedagogy from Arizona State University. As a lifelong musician Koger has been teaching private cello lessons for more than two decades and most recently instructed fourth- through eighth-grade students in Arizona’s Mesa and Tempe Public School systems, maintaining a long relationship with the American String Teacher Association and a dynamic ongoing role in music education with particular focus on beginning, intermediate and advanced string orchestra studies. She actively plays in chamber, orchestral, studio, instructional and theatrical ensembles. Koger actively plays in chamber, orchestral, studio, instructional and theatrical ensembles as a member of the American Federation of Musicians. Her work includes performances with The Phoenix Symphony, Arizona Opera, Arizona Theatre Company, Phoenix Theatre, commercial studios, and national Broadway touring shows ranging from The Lion King to Mary Poppins.